"The temple was really amazing, just hidden there in the middle of the forest were huge stone carvings and the vine and greenery crawling all over the place made it look very Tomb Raidery. We wandered around the temple for about half an hour and then walked back to where the guys were waiting for us. We walked back the same way we had come, easier to control yourself going uphill even in muddy situations but also a lot more tiring. When we arrive back to where the bike was parked we stopped to wash off some more mud in the stream and paid the guys." Gunung Kawi ("Mountain of poets") is located north of Ubud in the village Tampaksiring Bangli in the middle of Bali at the river Pakrisan. It's situated some 300 metres north of the bemo terminal in Tampaksiring, which is on the main road through the village. 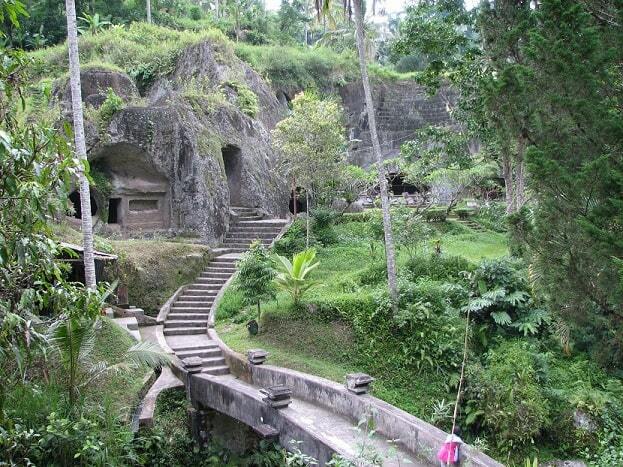 Here is the entrance to the path that brings you to the Gunung Kawi. The temple dates back to the 11th century and it is assumed that this ia the cemetery of King Anak Wungsu and his many wives. The Gunung Kawi is located in a valley. It is a complex of ten in the rock-cut Candi (stupas), which date back to the 11th century. It was thought they were that the grave monuments, but that's probably not right. Now they think it is that the manumits are in honor of the Royal family of the Udayana dynasty. There is also a, likewise in the rock-hewn, ruins of a Buddhist monastery. After you have, you have descended 371 steps in the steep Pakrisan River Valley, you can enjoy the wonderful view. If you want to go to the area where the temples are, you are required to put off your shoes. 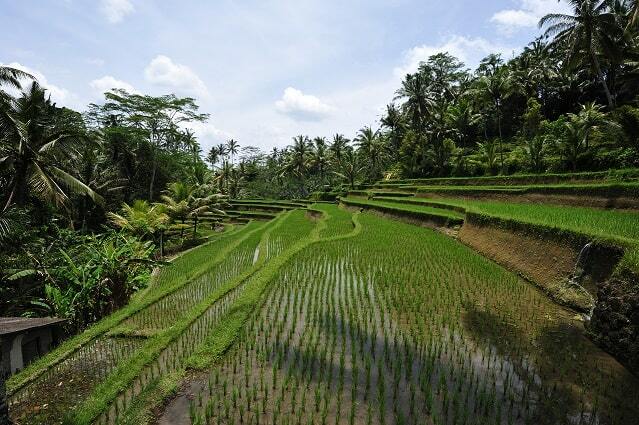 The strenuous walk is broken up into sections and at times the views as you walk through ancient terraced rice fields are as fine as any on Bali. Each candi is believed to be a memorial to a member of the 11th-century Balinese royalty, but little is known for certain. Legends relate that the whole group of memorials was carved out of the rock face in one hard-working night by the mighty fingernails of Kebo Iwa. Gunung Kawi has several beautiful Sawa and the River runs right through the center of the complex Pakrisan, which divides the complex into two parts. The smaller complex on the southern side of the River was probably used for the women of the King, while the larger complex perhaps was used by the King himself, and possibly for some of his concubines. About one km downstream you'll find the tombs. If you go up again you can relax at Cafe Kawi, where the drinks are cold and you can enjoy a fresh breeze. The temple is daily open from 8 o'clock in the morning until four in the afternoon. The temple is closed during religious holidays. "We actually got lost on the way to Gunung Kawi temple and ended up in a tiny village however it turned out to be the best mistake and I�d definitely recommend doing in this way in the end anyways! This is where we drove to, I�m not sure where the actual entrance to the temple was but we ended up at the end of a dead end road that petered out into rice fields. At the end of the road was a bunch of guys sat talking who told us we could walk from there to the temple and they would should us the way if we liked. We parked up the bike and followed them through some intricate paths through the rice fields, the ground was very muddy and we weren�t really prepared for this so we took our flip flops off and went barefoot. We were heading down a steep slope and as the rice fields stopped it turned into more jungle-forest territory we slipped, walked, jumped and fell down the slope, we came to a stream and a waterfall pool the guys asked if we wanted to swim but we weren�t prepared for that either so we just stopped to wash some mud off and carried on walking. We walk along another tiny path through some more rice paddies and came out in the temple grounds."